Healing Rooms: Our family is involved in the Healing Rooms run at our church, Stairway. On a Saturday morning once per month, people come along to receive prayer for all kinds of things. We have even prayed for someone’s dog. We are normally in groups of 3 people and pray for people as they come, usually for about ten minutes each person. We ask them what they would like Jesus to do for them today. We then ask God for what to pray for. We don’t need to wait long as God is always talking. If you say “hello” to a person, they don’t wait five minutes before saying “hello” back. They usually immediately respond. The same with God. If we don’t hear anything immediately to pray for, we just “hit” the condition with prayer ie if they have a cancer, and we don’t hear anything specific to pray for, we just speak to the cancer cells and the body etc and command healing. 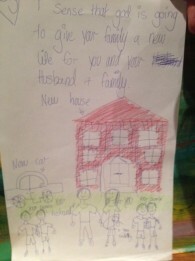 The kids have the option of praying for the person or asking God to give them a picture that they draw for the person. You don’t need to be a great artist. The picture usually really speaks to the person, no matter the quality of the drawing. Princess and the team she was on had the opportunity to pray at length for a lady who had recently miscarried her fifth baby. Princess drew a picture for her that was extremely significant to the lady and her family. Every part of the picture meant so much to the lady and her future, even down to the seven windows and double doors and new car. This was very encouraging for Princess. 40km Bike ride: Last Monday, Hubby and Matey (8) went for a bike ride along the beachfront down the Mornington Peninsula. I needed to do the business book work and accounts ready for the quarterly BAS and hubby’s work was quiet. He decided to take Matey out for the day so I could totally concentrate. Princess was enjoying reading several fiction novels about Jewish girls in World War 2 who were hiding from the Nazi’s etc. This kept her occupied for the day. Matey and hubby rode 20km down the Peninsula from Safety Beach to Blairgowrie, before stopping for lunch. They then had to ride back, a lot further than they had originally planned. A total of 40km was covered on the bikes which was a mammoth effort for Matey. He arrived home just in time to leave for his swimming lesson followed by his jazz dance lesson. The following day, he was understandably very tired. A great achievement which he thoroughly enjoyed. Prophetic words: We have been busy this week again writing and drawing prophetic words for all the students and teachers in the new school that is opening in Nepal. Basically we just ask God how He sees the people and what He wants to tell them. Then the first thing that comes into our mind that is encouraging, we write it down or draw it. It has taken a lot of time to do one for each student and teacher. It is exciting to know that they will all have a prophetic word over their life that they can put above their beds or in a special place where they can see it and be reminded in a personal way how God views them. This next week we will laminate them so that they keep longer. Learning about artists: My local doctor recently was sharing about how, when she shifted to Melbourne to do her medical training, she had never eaten out in a formal place before and was uneducated in a variety of cultural experiences. The impact of that was obviously so great as she had to mix with people vastly different to herself that she has urged me to make sure that our kids experience and are exposed to a variety of cultural experiences. My exposure to classical artists is very minimal. Thus, we have commenced putting a photocopy of a famous painting along with several interesting facts about the famous artist on the back of the toilet door for a week. The kids can now tell you what they think of “Starry Night” by Vincent Van Gogh and several interesting facts about him, including that he only ever sold one painting whilst he was alive. This last week was the “Mona Lisa” by Leonardo da Vinci. Next week is “The Girl with the Pearl Earring” by Jan Vermeer. I am figuring by doing this that we will be exposed to a number of artists and famous works of art over the year. We have also made use of the Monet Collection that was a temporary exhibition at the Victorian Arts Centre. Jackson Pollock’s “Blue Poles” was a must to view when we visited Canberra last year, not because of the picture but the amount of money the Australian Government paid for it. 2. What is the name of the painting? 4. What type of painting is it? 5. When & where was it painted? 6. What type of art or era? 7. Where is the piece now & how much did they buy it for? 8. Would you like to see the piece and why/why not? Dental visit: It never ceases to amaze me how the children love cleaning their teeth after they have visited the dentist. Unfortunately drinking cooled boiled water that was fluoride free for the first five years of their life has not helped protect their teeth from minor cavities. Both children agreed that visiting the dentist was not their favourite past time. They have shown a renewed vigour with cleaning their teeth after every meal since then. With the prospect of braces broached by the dentist for both kids when the timing is right, there has been a lot of discussion. Princess can have braces applied, according to the dentist, after we have finished our missionary trips overseas. We explained that we were likely to be increasing our trips overseas to help in mission situations, of which the dentist tried to say that we needed to visit him monthly for 24 months. Thus, in his eyes, we need to finish all our mission work first. (This dentist is also a dental surgeon and an orthodontist so we can have him treat the kids for everything). Thankfully, our trips at this stage are less than four weeks so we can fit it in but we did agree to wait until after our trip to Cambodia in July. Matey promptly asked for prayer at the Healing a Rooms on Saturday morning for straightening and proper alignment of his teeth as he doesn’t want to have braces. It would be great it if works!! Princess had a miraculous filling of 4 teeth last year when she was prayed for, so we are encouraging Matey in his prayer. 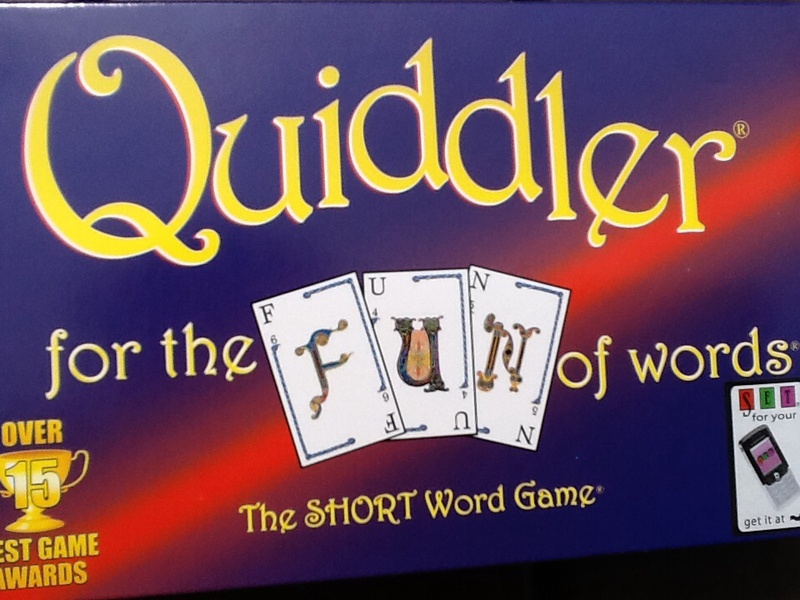 New Game: Quiddler is our newest game. Princess really loved it and wanted to keep playing but it took a bit of getting used to. Matey (8) didn’t really get into it. It is aimed at kids aged 8+ but I think it is better suited to aged 10+. A fun game where you get 3 cards the first round, then 4 cards the next round and keep increasing by one card each round until you have a total of 10 cards. The object is to be the first person to get rid of all your cards by making words out of the cards in your hand. The letters are all worth different points with more points allocated to the harder letters to make into words. Plus, the person in each round who makes the longest word gets an additional ten points as well as the person who makes the most number of words. Keeps you focussed. Great for teaching dictionary use as well as broadening your range of words. Definitely recommend it.